Before you learn how to create a table in AWS Athena, make sure you read this post first for more background info on AWS Athena. When you create a table in Athena, you are really creating a table schema. The underlying data which consists of S3 files does not change. You are simply telling Athena where the data is and how to interpret it. Therefore, tables are just a logical description of the data. Just like a traditional relational database, tables also belong to databases. Therefore, databases are also logical objects, which exist to group a collection of tables together. Databases and tables do not need to be created before the data is placed in to AWS S3. Similarly, if a table or database is dropped, the data will remain in S3. All DDL statements in Athena use HiveQL DDL. Thankfully, you don’t need to be an expert in HiveQL DDL to create tables, you can learn as you go along. You can even use a wizard in the AWS console to create tables. You can script out the DDL from existing tables using the Athena console and this will give you guide for future tables. The data used in the demo is a free download from data.gov.uk. They also have loads of data in various formats which you can use for testing. Some syntax in HiveQL DDL is similar to ANSI SQL however there are are few key differences. SerDes are libraries which tell Hive how to interpret your data. SerDe is short for Serializer/Deserializer. There are a few to choose from that Athena supports and you cannot currently add you own. You can use the create table wizard within the Athena console to create your tables. Just populate the options as you click through and point it at a location within S3. You must have access to the underlying data in S3 to be able to read from it. This method is slightly laborious as a result of all the screens and dropdowns, however it is reasonable enough when you only need to create a small number of tables. First of all, select from an existing database or create a new one. Give your table a name and point to the S3 location. Various data formats are acceptable. Parquet and ORC are compressed columnar formats which certainly makes for cheaper storage and query costs and quicker query results. Other formats such as JSON and CSV can also be used, these can be compressed to save on storage and query costs however you would still select the data format as the original data type. e.g. For .csv.gz – you would choose CSV. Above all, data should be partitioned where appropriate, such as by day or by customer ID. Wherever it makes sense as this will reduce the amount of data scanned by Athena which reduces cost and improves query performance even more than compression alone. 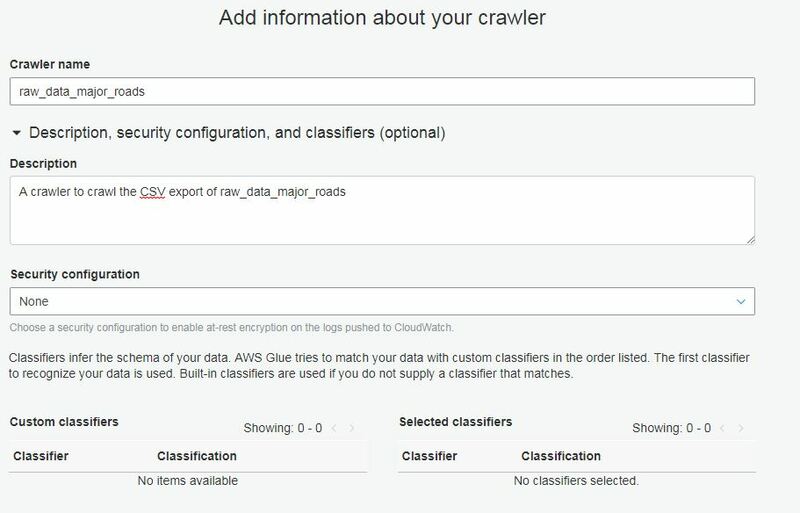 An AWS Glue crawler will automatically scan your data and create the table based on its contents. Due to this, you just need to point the crawler at your data source. Once created, you can run the crawler on demand or you can schedule it. Hence, scheduling is highly effective for loading in new data and updating data where underlying files have changed. Point the crawler to your data store. Select or create an IAM role. The crawler runs under an IAM role which must have the correct permission to create tables and read the data from S3. Choose a schedule for your Glue Crawler. Declare the output location for your data. Finally, query your data in Athena. You can type SQL into the new query window, or if you just want a sample of data you can click the ellipses next to the table name and click on preview table. This method is useful when you need to script out table creation. As well as the AWS Athena console, you can also use programs such SQL Workbench/J which rely on a JDBC connection.